The No. 8 Blue Crown Spark Plug Special in Henderson, Nevada currently for sale has no history to it. The owner is asking $400,000, but only received an offer of $250k a year ago, which he declined. It’s the only six cylinder Offenhauser engine built. There were four Blue Crown race cars, with the Joe Lencky chassis being the fifth. One of the cars was in the Smithsonian Institute and the cars travel around to various museums. Apparently Joe Lencki was a most colourful person, being extremely opinionated and difficult. And as I’ve written, there were actually at least two Lencki Specials built, (perhaps 3-4?) although the six cylinders “Lumps” were indeed the only ones ever produced by Offenhauser. As noted, Lencki started with a two valves per cylinder variant, which would become known as the “Little Six,” with a four valve variant being produced afterwards, as the No. 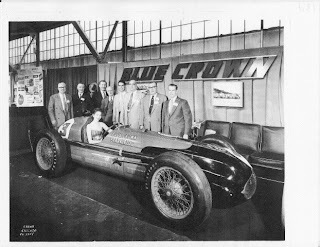 8 Blue Crown Special is the “Little Six.” In the early 1960’s Lencki once again approached Leo goosen to produce him a turbocharged version of his six cylinder engine, of which Goosen at the time was too far involved in the Offenhauser Turbo project to do so. Mauri Rose* began the 1941 race from the Pole position in the No. 3 Elgin Piston Pin Special Maserati, but retired on lap 60, before being drafted to replace Floyd Davis in his No. 16 Noc-Out Hose Clamp Special on lap 72, as both drivers were competing for Lou Moore. Born: Sept 12, 1904: Hinton, Oaklahoma; Died: March 25, 1956: Lakewood Park, Atlanta, Georgia. Racing driver; Won 1932 Indy 500 Pole; 9 Indy 500 starts; Best finish: 1928; Second; Other top 5 finishes: 1934-35; Third. After retiring as a race driver; Moore becomes a (5 time) Indy 500 winning car owner. Becoming the very first Team Owner to win Indy three consecutive years; and would have been the only one to finish 1-2 three consecutive years had Rose followed his orders! The only other Team Owner to duplicate Moor’s feat of winning Indy three consecutive years is some chap known as The Captain, a.k.a Roger Penske who accomplished this from 2001-03. Yet, some Dude named Paul Tracy messed up Penske’s 1-2 (2002 Controversy) sweep by finishing runner-up in ‘02 to Helio Castroneves, while his teammate Gil De Ferran finished 10th that year; hence Moore’s (1947-49) three year finishing streak statistic is better percentage-wise then Penske’s. The Blue Crown Spark Plug Special is one of only four chassis to ever win Indianapolis two consecutive years in a row with the same driver. The only substantive information I could dig up upon him was a story about the 1952 Rodchester Special; built for Comedian/Actor Eddie Anderson.